Banbury Cross Therapeutic Equestrian Center has been established to better the quality of life for people with special needs through therapeutic equestrian activities. The center provides the opportunity for each rider to develop to his or her greatest potential. Through training and involvement of staff and volunteers, Banbury Cross also hopes to strengthen understanding toward people with special needs. 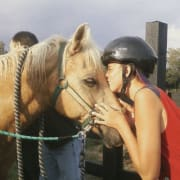 Our program has been one of the premier therapeutic riding centers in Oakland County since 1991. We serve over 120 riders each year through mounted and unmounted riding programs. In addition to our private lessons, we have partnered with Oxford and Lapeer Community Schools and their special education program rides with us during the day. We offer a cost-free program to veterans through our Wounded Warrior project. Our program is a spectacular program but we can't do it without the help and support of our volunteers! It takes up to 80 volunteers each week to help our program function safely! Would you recommend BANBURY CROSS THERAPEUTIC EQUESTRIAN CENTER?